Arrow Ceiling has done Popcorn Ceiling Removal, Popcorn Ceiling Repair, Drywall Repair, and Texture Ceilings and Walls since 1987. Residential home builders in Seminole applied acoustic ceiling texture commonly referred to as popcorn ceilings. Many builders actually touted it as an upgrade and a way to reduce echoes. What it really did was to cover up poor workmanship, i.e. poor drywall installation and the taping of seams on the ceiling. As these homes age, the popcorn ceilings take on a dull yellowish brown appearance. The reason for that appearance is popcorn is a porous surface that absorbs airborne pollutants that can only be eradicated by the process of popcorn ceiling removal. A short term solution could be Popcorn Ceiling Repair if you are limited with funds. Painting is a temporary solution; as it can only cover up the dulled appearance of the popcorn itself and does little to change the overall aesthetics of the room. Whether you are buying or selling a Seminole home having popcorn ceiling removal done instantly updates and adds value to your home or realestate investment project. Some of the key benefits are increased natural light and reduced allergens, along with the visual appeal of custom ceiling textures! We are also a licensed and bonded painting contractor. 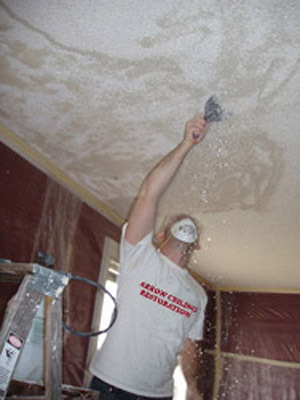 If you're looking for a Seminole Florida Ceiling Contractor Specializing in Popcorn Ceiling Removal, Popcorn Ceiling Repair, Drywall Repair, and Texture Ceilings and Walls, contact Arrow Ceiling Restoration today at (727) 804-5411, or complete our estimate request form.